The male dark fishing spider is just dying to father some children – and this death wish probably evolved to benefit his offspring, according to new research from the University of Nebraska-Lincoln and Gonzaga University. Though the extreme behavior seems especially counterintuitive given that females will mate with multiple males, Schwartz and his colleagues have proposed several explanations for it. 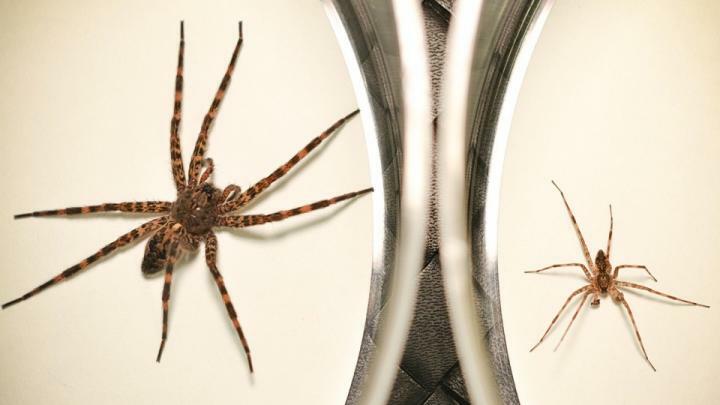 Because the female dark fishing spider is about 90 percent larger than the male, any attempts to resist cannibalization would probably – and probably did – prove futile. With no reasonable alternative, males may simply be "making the best of a bad situation" by offering themselves up as an offspring-enriching meal, Schwartz said. The behavior could also have evolved in response to first-male sperm precedence – the fact that the first male to mate with a female gets to fertilize far more of her eggs than do the males that follow. Though research has yet to confirm first-male precedence in the dark fishing spider, Schwartz said that males seem to prefer virgin mates. And if the species' reproduction does adhere to first-male precedence, the value of surviving to mate with other females would diminish in short order.